Together with several benevolent organizations, the New Orleans German community was anchored and enriched by several singing societies. The earliest of these groups, the chorus of the Turn-Verein (1851), was joined by the Deutsche Männergesangverein (1873), the Liedertafel (1878), Frohsinn (1885), the Liederkranz (1889), and eventually the Deutsches Haus Sängerchor (1929), among others. The societies maintained detailed records that provide information about members, discussions of concerts, evening entertainments, excursions to nearby tourist attractions, and their daily operations. Some societies, such as the Liedertafel, admitted non-German-speaking members in an effort to raise revenues for their expensive spectacles. Eventually such policies led to dissension, and in the case of the Liedertafel, resulted in the formation of a new organization, Frohsinn, which pledged to avoid such dangerous courses of action. The musical productions of Frohsinn were elaborate affairs, requiring managerial skills to coordinate the activity of musicians, singers, soloists, scenic designers, stage bands, ticket sales, security forces, and the local brewery. The German love of music cannot truly be measured by attendance at programs of world famous performers, but rather by their overwhelming participation in the productions. Frohsinn specialized in short musical farces. Their music archive (primarily containing music printed in Germany) reveals much about their entertainments. The color lithographs illustrating the suggested costumes are representative of recurring themes: music, love, marriage, life, and fashion. This collection is referred to as the Deutsches Haus Musik Archiv and is part of the larger Deutsches Haus Collection (MSS 609). Whenever possible, members of the local singing societies attended the North American Sängerbund Festival, the national convention of German singing societies. New Orleans was chosen for the site of the 1890 gathering, the first in the South. Hosting such an event was a massive undertaking. Five singing societies of New Orleans were expected to host 64 societies with some 1,700 singers. The entire population of New Orleans rose to the occasion. After rejecting the Fair Grounds, Spanish Fort, and the Washington Artillery Hall as sites, it was decided to build an architecturally attractive wooden hall that could seat 5,000 spectators with a stage accommodating 2,000 singers and orchestra. A site facing Lee Circle was chosen as the location for the Sängerfesthalle. When the curtain rose on opening night (February 12, 1890), the massive hall (150 feet on St. Charles Avenue, 200 feet deep, with a 96-foot stage) held the largest known audience to date for a musical event in the Crescent City. A large pressroom, well stocked with food and a variety of liquid refreshments, accommodated the media. Mayor Joseph Shakspeare, who had studied German for the event, led the citizens in a brilliant display of hospitality during the festival. Many German musicians who immigrated to the United States established themselves as music publishers. Some German musicians who settled in New Orleans followed that well-established pattern. Emile Johns, the earliest sheet music printer known in New Orleans, was born in Poland and educated in Vienna. His Album Louisianais is believed to be the first music with a New Orleans imprint. Other local German musicians-turned-publishers include Theodore von LaHache, Henri Lehmann, Philip Werlein, and Louis Grunewald. The Werlein and Grunewald firms were celebrated in music on various occasions with images of their stores gracing the sheet music covers. Deutsches Haus Collection: Deutsches Haus Musik Archiv (German Music Archive 1888–1983). MSS 609.7. 491 items. Collection of the music sung and performed by the musical societies of the Deutsches Haus. Includes sheet music with color-lithograph title pages for musical comedies, as well as choral music. Also includes programs and music from the “Sängerfeste” (annual gatherings of German singing societies from around the country) attended by these societies, song books, and other materials. Deutsches Haus Collection: Musical Societies (German Music Societies’ Records 1879–1950). MSS 609. 25 items. Meeting minute books, financial records, correspondence books, and other materials from the musical societies of the Deutsches Haus (New Orleanser Quartett Club, Frohsinn, Deutsches Haus Sängerchor, Deutscher Männergesangsverein, Liederkranz, Harugari Männerchor), as well as material from the 26th annual Sängerfest, held in New Orleans in 1890. Werlein’s Scrapbooks. Acc. No. 2005.0154. 7 items. Materials related to the productions, sales, and various activities of the Werlein’s music store from 1842–1930, 1934–1967, and 1977–1978. Includes newspaper clippings, advertisements, and other forms of ephemera and memorabilia. Louis Moreau Gottschalk Collection, 1842–1911. MSS 245. 267 items. Correspondence, programs, and other memorabilia concerning the life of Louis Moreau Gottschalk, as well as sheet music and manuscript music primarily composed by Clara G. Peterson. Von Meysenbug-Lyons Family Papers, 1859–1983. MSS 293. 532 items. This collection contains correspondence, programs, photographs, carnival invitations, and sheet music. The autographs collection includes noteworthy performing artists and composers. Richard Wagner is among those represented in the collection. Louis Moreau Gottschalk Letter, 1869. MSS 301. Letter (9 February 1869) written by Gottschalk from San Isidro, Peru describing the climate, superstition, Indian and African rites. He reviews the financial reversals suffered in California, and records his successes in Buenos Aires and Chile. Leonard V. Huber Collection, ca. 1820–1953. MSS 465. Within this collection is an autographed program from a concert by Josef Hofmann at the Athenaeum on 3 March 1920, as well as a sheet containing the cast for a production of the opera The Huguenots; on the back is written “Last performance Dec. 2, 1919 opera burned during the night of Dec 4.” There is also a libretto for the opera. Thee collection contains other programs from the Grand Opera House, as well as a promissory note of C.E. Schmidt to L. Placide Canonge, Opera House of New Orleans, dated 1 July 1872 and a receipt issued to C. E. Schmidt from the New Orleans Opera House Club Room for payment of his subscription to May, 1873, dated 25 November 1872. It also includes a small assortment of theater programs from Beverly Dinner Playhouse, St. Charles Theatre, Crescent Theatre, Tulane Theatre, Jerusalem Temple, Chinese Theatre, The Municipal Auditorium, Lafayette Theatre, and Dauphine Theatre. These items can be found in section G of the collection. New Orleans Police Minstrel Program, 1932. 62-26-L. 1 volume. The program contains pictures of various New Orleans public officials and advertisements for several businesses. There are 290 pages in this program, and it includes the Roll of Honor for the New Orleans Police Department. Performance held at the Dauphine Theatre. Opera in New Orleans Collection, 1898–1925. 82-88-L. 23 items, 3 volumes. Librettos for Madame Butterfly, L’Apollon De Bellac, and Orphée along with French Opera House programs; programs for the 1925 Grand Opera Season at Tulane Theatre, Melba and her concert company at the Greenwall Theatre, and Mme. Alma Gluck at the Athenaeum; and five scrapbook pages with newspaper clippings regarding opera starts and composers affixed to them. Also in the collection are postcards of Fely Dereyne and of Miss Mary Garden as Solomé. "Programs," 1886–1953. 84-81-L. ca. 813 items. This collection includes musical programs for the French Opera House, the Athenaeum, the Philharmonic Society of New Orleans, the New Orleans Symphony Association, the New Orleans Choral Symphony Society, the St. Charles Theatre, and the Tulane Theatre. It also contains Werlein’s Journal of Music Vol. III, no. 5, 1886. Grand Opera House Concessions Contract, 1892. 88-55-L. 2 items. Contract between Jacob J. Goldman and H. Greenway & Son gives the right to sell peanuts, candies, and cakes in the gallery of the Grand Opera House, Canal Street. Dr. Gustave Keitz German Singing Society Collection, 1912–1914. 94-82-L. 3 items. Dr. Karl J. R. Arndt Collection of J. Hanno Deiler Papers and Deutsche Gesellschaft Records, 1852–1919. 97-5-L. ca 813 items. Includes a scrapbook with news clippings, programs, letters, and fliers related to the Quartet Cub as well as a “Quartet” file and several files pertaining to Deiler, several programs, sheet music, and a photograph of Wilhelm I service at St. Charles Theatre. Charles H. Blake Diary, 1861–1862. MSS 262. 1 item. Blake kept this diary intermittently from 1 April 1861 to 20 September 1862, when he sent the volume home. Blake arrived in New Orleans as part of the occupying forces on 6 May 1862; thereafter he writes about this city. He describes federal efforts to feed the hungry citizens: a mostly female crowd became so large and pressing that the soldiers had to protect themselves with fixed bayonets. He also records his dismay when soldiers fired on a group of runaway slaves who had escaped by boat to New Orleans and had refused to accept General Butler's order that they be returned to their plantations. Like most visitors, Blake comments on the problems of burial, the unusual street names, and sabbath-breaking in New Orleans. He describes a German concert where the program included operatic duets, waltzes, and some Chinese vaudevillians who swallowed fire and did knife-throwing tricks. Intended for home consumption, the diary records Blake's own churchgoing activities but does not neglect descriptions of all the "scrapes" in which other soldiers, "the boys," became involved, including one case of delirium tremens. Throughout the diary Blake writes with humor and high spirits. He never explains why he had to walk so many extra hours of guard duty. New Orleans Invitation and Ticket Collection, ca.1874–c. 1900. 78-28-L.2. 116 items. An artificial collection of tickets and invitations to various fund raising activities, picnics and balls. These events were hosted by the German Men's Benevolent Society, the Girls of St. Mary's School, the Orphans at St. Mary's Hall, the Charm Social Club, the Germania Lodge No. 39, and other organizations. Broadside for Adelina Patti's grand farewell operatic concert on 26 January. MSS 175. 1 item. The concert will take place on Thursday at noon at Bidwell's St. Charles Theatre. The concert consists of three parts and includes the second scene from Donizetti's Lucia di Lammermoor and the entire second act from Rossini's Il Barbiere di Siviglia. Accompanying Madame Patti is the Grand Orchestra under the direction of Signor d'Auria and pianist, Signor Gorno. The broadside states that seats will be sold at the piano rooms of P. Werlein. "Harmony in the Home" and "Remember That Song." 83-91-L. 14 items. "Harmony In The Home" published by Philip Werlein, Ltd. which contains stories on Helen Laurense Bannon, the closing of New York's Academy of Music, and music education in the city of Auburn, New York. "Remember That Song" is a collectors club letter written by Lois Cordrey, of Glendale, Arizona. Programme. 97-21-L. 1 item. Music production with advertisement for Philip Werlein, n.d., Geo. Ellis, print(er).Laura Hyde Moss Journal, 1851–1853. MSS 417. 1 volume. Laura Hyde Moss lived at 24 Apollo Street in New Orleans. She was the daughter of George W. and Jane Moss. She died at the age of seventeen on 7 February 1855. Laura was thirteen years old when she began keeping this journal. She writes about the courses she is taking at school and music lessons at home. Her piano teachers were Miss De Brueys and Mr. Grunewald. Laura loved to read and quite often comments on what she is reading or had read. In writing her journal Laura comments on the weather and various daily activities. View of large ornamental clock at West End Amusement Park in Lakeview. Anonymous postcard from a drawing of a replica of the famous clock in the Eden Museum in Strasburg, Germany. Between August 13, 1907 and 1915. Acc. No. 1982.55.32. German Day Singers, New Orleans. Anonymous photograph from a newspaper. November 24, 1912. Acc. No. 1974.25.25.223. Musical program from the “Deutscher Tag der Welt Industrie und Cotton Ausstellung von New Orleans, La.” Anonymous photograph of the program from German Day at World's Industrial and Cotton Centennial Exposition 1885. Between 1950 and 1974. Acc. No. 1974.25.2.89.; 1974.25.2.90. The Volksfest, or German May Festival, at New Orleans. May 26, 1859. Anonymous illustration (wood engraving). View of the German May Festival in a park; there are flags, tents, and bandstands; many people in clothing and dress of the day are standing about, listening to a band, seated at tables; there are several men on horseback. Acc. No. 1955.22.1; 1955.22.2. The Volksfest, or German May Festival, At New Orleans. May 28, 1859. Anonymous illustration (wood engraving). View of the German May Festival in a park. Acc. No. 1974.25.2.204. The Volksfest, or German May Festival, At New Orleans. May 23, 1859. Anonymous illustration (wood engraving). View of the German May Festival in a park. Acc. No. 1974.25.2.205. Rex parade, Float 20, Germany. Anonymous glass positive from February 12, 1907. Acc. No. 1981.261.68. Note from Bismarck to the Deutscher Männergesangverein of New Orleans. Anonymous photograph of Bismark’s June 9, 1895 note to the society, in which he accepts an offer to be an honorary member. Acc. No. 1974.25.28.99. 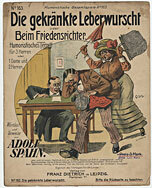 German Singing Societies Poster. Print poster by Raymond N. Calvert (designer) for the German Heritage Festival Association celebrating the Oktoberfest Parade. Shows a sketch of Die Festhalle on Lee Circle. Lists German singing Societies: Deutsches Haus Männerchor and Damenchor, Liederkranz, Liedertafel, Frohsinn, Quartett Club, Harugari, Männer-Gesangsverein, Liederkreis. Created for 1990. Acc. No. 1994.141.4. 1994.127.58; 1994.127.170 (“Merlin/ Viviane”); 1994.127.167.1 (“Boehmen”); 1994.127.167.2 (“Tyrol Zillerthal/ Oesterreich”); 1994.127.60 (“Ober Oesterreich Linz”); 1994.127.59 (“Ungern”); 1994.127.63 (“Brasilaner”); 1994.127.62; 1994.127.61 ( “Schalksnarr”); 1994.127.78; 1994.127.76-82. Some sketches are accompanied by German language notes. Philip Werlein / Southern Music House. Color lithograph print by Benedict Simon (lithographer) of facade of three story building with cast iron balconies on second and third floors, extending to four story building at right; structure on left has elaborate iron balcony with cornice; presently 300 block Baronne Street in Central Business District. Between 1869 and 1877. Acc. No. 1949.1.26. National Theatre, Corner of Baronne and Perdido Streets, New Orleans. Anonymous print from wood engraving of front and side view of National Theatre (later known as Werlein Hall) which opened in 1866; designed by architect William Thiel; shows pedestrians and horse-drawn streetcar; presently 834–840 Perdido at Baronne and Carroll Streets in the Central Business District; 400–420 Baronne Street; 401–421 Carroll Street. c. 1873. Acc. No. 1951.41.8. Werlein Hall, Baronne St., corner of Perdido, For Rent by the Day or Night…Anonymous print from wood engraving. 1800s. Acc. No. 1959.172.5. Society Talks. Anonymous magazine cover illustration. (i) Front cover; (ii) inside front cover: Maison Blanche advertisement for Easter clothing and fashions; (iii) inside back cover: Philip Werlein, Ltd. music store advertisement for Chickering baby grand piano; (iv) back cover: Mark Isaacs Company, 711–725 Canal Street, advertisement for New Spring millinery. April 1922. Acc. No. 1982.200 i-iv. Philip Werlein … Pianos, Organs, Music. Color lithograph trade card by Bowers, Albert (lithographer?) showing a snow scene with cows. Between 1877 and 1894. Acc. No. 1983.42.9. Philip Werlein / Pianos, Music, Organs, Small Instruments. Anonymous printed advertisement from between 1894 and 1905. Acc. No. 1974.25.1.74. President Taft playing golf with Philip Werlein on visit to New Orleans, 1909. Anonymous copy photograph from between 1950 and 1973. Acc. No. 1974.25.27.422. Werlein Hall 1900s. Anonymous photograph of wood engraving illustration. Acc. No. 1974.25.36.139. Werlein Hall for rent, 135 Canal Street. Anonymous photograph of wood engraving advertisement from the 1900s. Acc. No. 1974.25.36.140. Sohmer Pianos; view of baby riding a butterfly. Color lithograph and printed trade card by Bartsch, H. (lithographer. Verso shows advertisement for Grunewald Hall & Music Store at present 121–135 Baronne Street in Central Business District. Between 1873 and 1884. Acc. No. 1958.31.21. J. & C. Fischer pianos of New York and Grunewald's Music Store. Color lithograph and printed trade card showing views of piano and large bouquet of roses; verso: testimonials for pianos. Between 1873 and 1881. Acc. No. 1958.31.22; 1958.31.23; 1958.31.24. B. Shoninger Organ & Piano Company, Louis Grunewald local agent, located at 711 Canal Street in the Central Business District. Color lithograph and printed trade card by August Gast & Co. (lithographer). Shows view of man and woman at organ, flowers, birds, and angels. Verso shows view of the Shoninger factory in New Haven, Connecticut. Between 1880 and 1885. Acc. No. 1958.31.371. Grunewald Pianos 18, 20, and 22 Baronne Street. Anonymous print from wood engraving. 1873. Acc. No. 1974.25.36.65. Grunewald Hall. Anonymous copy photograph. 1900s. Acc. No. 1974.25.36.66. Reproduction of chalk drawing “People watching play at Grunewald.” Anonymous color reproduction of chalk drawing. 1900s. Acc. No. 1974.25.36.219. The Carnival of Mardi Gras, At New Orleans. Relief halftone print from the periodical Collier’s Weekly (publisher) with eight illustrations showing Miss May Eola Grunewald, Queen of the Falstaffians; Miss Alice Posey, queen of the Crew of Nereus; Alfred Hennen Morris King of Carnival; Miss Bessie Merrick, queen of the Carnival; Miss Corinne Desommes, Queen of the Twelfth Night Revellers; The Landing of Rex's Yacht and Fleet, a crowd gathered before Gallier Hall in the Central Business District, and a medallion with a pelican feeding her young. March, 1901. Acc. No. 1990.140.4. Exterior view of Mechanics' Institute from between 1857 and 1908. Anonymous copy photograph showing front and side of building, four-story building with three level facade, with four central columns. Tulane Hall and University of Louisiana visible on building. Designed by James Gallier 1855. Demolished and replaced by Grunewald Hotel 1908. Shows partial view of adjacent buildings, lampposts, wires, telephone pole, ironwork, "Grunewald's Music House…" advertisement in background. Between 1960 and 1965. Acc. No. 1999.60.46. Relf, Annette Huger. “Carnival German Waltz” / By Miss Annette Huger Relf. New Orleans: Ph. Werlein Ltd., 1905. LC: M32 .R4/C3 1905. Hoss-T., Johnny Straws. “The Real No. 5 Camp Street Polka; Commonly called the German Polka and sometimes the Real Russian Polka.” New Orleans: Wm. T. Mayo, [n.d.]. LC: M31 .H68/R4 1846. "German Polka; Real No. 5 Camp Street." [New Orleans]: Wehrmann, 186–. LC: M31 .G42/G4 1855. Daniele, Giuseppe. "Souvenir of Germany; A New Schottisch" / Daniele, Giuseppe Arranged by Charles Grobe. Philadelphia: Lee and Walker. 1850. LC: M204 .G7/S6 1850. Meyer, Robert. “Germania.” New Orleans: Wm. T. Mayo, [1851?]. LC: M31 .M4/G4 1851. Meyer, Robert. “Germania: polka allemande; pour le piano.” Nouvelle Orléans: Wm. T. Mayo, [1851?]. LC: M22 .M4. Meyer, Robert. “East Pascagoula summer diversions: two German polkas; for the piano.” New Orleans: Wm. T. Mayo, 5 and 93 Camp St. ca. 1851. LC: M22 .M4. Fields, Warren Carl. The life and works of Theodore von La Hache / by Warren C. Fields. Ann Arbor, Mich.: 1973 , 1988. 21 cm. LC: ML410 .L3/F5 1973. Grunewald, W. N. "Southern Belles Waltz; Melody of Capitani" / By W. N. Grunewald. New Orleans: L. Grunewald Co., Ltd., 1897. LC: M32 .G78/S6 1897. Dejan, Edouard. "La Chatouilleuse" / By Edouard Dejan. Copyright by Philip Werlein. New Orleans: Philip Werlein, c1877. LC: M32 .D4/C43 1877. Lehmann, H. E. “La couronne impériale: de L’étoile du Nord, musique de G. Meyerbeer: grande valse pour le piano / par H.E. Lehmann, Chef d'Orchestre des Soirees et Artiste du Theatre d'Orleans.”—Nlle. Orléans: H.E. Lehmann. c1855. 36 cm. LC: M32. L4/C68 1855. Lehmann, H. E. “Azucena et les Bohemiens; No. 1 Mazurka” / by H. E. Lehmann. From the opera Il Trovatore by Giuseppe Verdi.—New Orleans: H. E. Lehmann, 1858. LC: M39 .L45/A9 1858. Lehmann, H. E. “Belzebuth 'Les Amours du Diable' Polka de Salon” / by H. E. Lehmann. New Orleans: H. E. Lehmann, Inc., 1857. LC: M31 .L4/A45 1857. Lehmann, H. E. “Le Bouton de Rose” / by H. E. Lehmann. New Orleans: H. E. Lehmann, 1853. LC: M31 .L4/B6 1853. Lehmann, H. E. “‘Le Camp Russe Grande Schottisch’ / by H. E. Lehmann, Chef d'Orchestre des Soirees et Artiste du Theatre d'Orleans.” New Orleans: H. E. Lehmann, 1856. LC: M31 .L4/C3 1856. Lehmann, H. E. “‘La Chatelaine’ / by H. E. Lehmann, Chef d'Orchestre et Bal de Societe et Artiste du Theatre d'Orleans.” New Orleans. H. E. Lehmann, [n.d.]. LC: M31 .L4/C45 1850. “Les Filles de Marbre Polka” / Arranged for the piano from the original dramatic music by H. E. Lehmann. New Orleans: H. E. Lehmann, 1854. LC: M31 .M65/P6 1854. “Les Filles de Marbre Polka” / Arranged for the piano from the original dramatic music by H. E. Lehmann. New Orleans. H. E. Lehmann. 1854. LC: M31 .M65/P6 1854. Lehmann, H. E. “Gastibelza; Polka Mazurka” / By H. E. Lehmann From the opera comique by F. Maillard. New Orleans. n.d.. LC: M31 .L4/P65 1850.Lehmann, H. E. “L'Hortensia; Redowa Polka; No. V” / By H. E. Lehmann. New Orleans. 1853. LC: M31 .L4/H6 1853. Lehmann, H. E. “L'Oeillet” / By H. E. Lehmann. New Orleans. 1853. LC: M31 .L4/O3. Lehmann, H. E. “Pelican Polka” / By H. E. Lehmann. New Orleans: H. E. Lehmann, 1855. LC: M31 .L4/P4 1855. Lehmann, H. E. “La Valentine” / By H. E. Lehmann, Orchestra Leader, Theatre d'Orleans. New Orleans. n.d. LC: M31 .L4/V3 1846. La Hache, Theodor von. “I've fallen in the battle, [Grande Fanatasie], opus 620” / by Theod. von La Hache. New Orleans. Louis Grunewald, c1865. 33 cm. LC: M27 .L33/G7 1865. LaHache, Théodor von. “Carrie Bell: ballad” / words by Capt. W.C. Capers; music by T. von La Hache. Augusta, Ga. Blackmar & Bro. c1861. 30 cm. LC: M1618 .L3/C3 1861. LaHache, Theodor von. “I would like to change my name: a favorite encore song” / composed by Theod. von La Hache (opus 538). New Orleans. Louis Grunewald. 1862. 34 cm. LC: M1 .A15 Vol. 16 No. 29. Baylor, Eugene. “Margrave gallop” / composed by Eugene Baylor; transposed and arranged by Theod. von La Hache. New Orleans. Louis Grunewald. 1866. 33 cm. LC: M31 .B33 M3 1866. La Hache, Theodore von. “Parade march and quick step” / by Th. von La Hache. New Orleans: Published by P.P. Werlein & Halsey, 3 & 5 Camp St., [c1861]. 36 cm. LC: M1642 .L3/P3 1861. La Hache, Theod[or] [von]. “The New Orleans & Great Northern Railroad Polka” / By Theod[or] [von] La Hache. New York: Firth, Pond & Co., New Orleans: P. P. Werlein, 1854. LC: M31 .L3/N4 1854. La Hache, Theodor von. “New Pic Nic Polka, op. 211” / By Theodor Von La Hache.—New Orleans: P. P. Werlein, registered by T. La Hache, 1858. LC: M31 .L3/N42 1858. La Hache, Theodore von. “Passe Partout Nouvelle Polka Allemande” / By Theodore Von La Hache. New Orleans: Ph[ilip] P. Werlein, 1854. LC: M31 .L3/P3 1854. La Hache, Theod[or] von. “Pic Nic Polka” / By Theod[or] Von La Hache. New Orleans: Louis Grunewald, 1854. LC: M31 .L3/P5 1854a.La Hache, Theod[or] von. “Silverspoons Schottisch” / By Theod[or] Von La Hache. New Orleans: Louis Grunewald, 1868. LC: M31 .L3/S5 1868. "Darmstadt." A.E. Blackmar. New Orleans. 1875. LC: M25 .K45/D3 1875. La Hache, Theodore von. “Mon bonheur: troisieme mazurka” / compose par Theod. von La Hache. New-Orleans: Published by Ph. P. Werlein & Co., 5 Camp St., c1857. 87-804-RL. La Hache, Theodore von. “Washington artillery: polka march” / arranged by Theo. von La Hache. St. Louis; Chicago; Cincinnati; Galveston; New York: J.J Dobmeyer & Co. De Motte Bros., J. Goggan, J.J. Dobmeyer & Co., J.L. Peters. c1865. 87-802-RL. Grunewald Hall, German Society of New Orleans: created for January 27, 1881. Invitation. Merkel & Ottmann Mayer, lithographers. 1979.277.1. 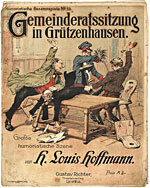 German Society, At Grunewald Hall: created for January 27, 1881. Admit card. Merkel & Ottmann Mayer, lithographers. 1979.277.2. "Family Evening" of the New Orleans Quartett Club, Odd Fellows Hall, Prof. J. Hanno Deiler, president (in German): April 28, 1908. Poster. 1974.25.36.153 a,b. "Family Evening" of the New Orleans Quartett Club, Odd Fellows Hall, Prof. J. Hanno Deiler, president (in German)]: April 28, 1908. Poster. 1974.25.36.154. "The long, long weary day = Den lieben langen Tag: a Germany melody." Words translated from the German and arranged for the pianoforte. Baltimore: Published by Miller & Beacham, successors to F. D. Benteen, c1853. 91-757-RL.28. Oliver Ditson & Co. “Gems of German Song: A collection of the most beautiful vocal compositions, of Beethoven, Von Weber, Mendelssohn, Schubert, Abt, Kucken, Bumbert Krebs, Reichardt, Spohr, Proch, Keller, etc…” Boston: Oliver Ditson & Co., 1865. 93-310-RL. “In Concert to Benefit Cultural Treasures of New Orleans: The Rascher Saxophone Quartet from Germany.” New Orleans. 1992. 2001-221-RL.5. Philip Werlein Limited… Presents 'The Prince of Lyric Tenors' Alessandro Bonci…Jerusalem Temple, Thursday Evening, January 20, 1921: 1921. 94-778-RL. Maumus, Elisée Vincent. Discours Prononcé a Grunewald Hall a l'Occassion du 50e Anniversaire de l'Épiscopat de S. S. Le Pape Pie IX. Nouvelle-Orléans: Imprimerie du Propagateur Catholique, 1877. 93-364-RL. Werlein, P. P. "Amilda Polka" / [by P. P. Werlein]. New Orleans: P. P. Werlein, 5 Camp St., 1859. 86-1912-RL. Lehmann, H. E. “La Fleur d'Oranger”/ by H.E. Lehmann. New Orleans. 1853. 86-1118-RL. Lehmann, H. E. “L'an de grace: polka mazurka” / par H. E. Lehmann, chef d'orchestre de soir es bals et artiste du Theatre d'Orleans, No. 205 Rue St. Philippe. New-Orleans (No. 5 Camp St., New Orleans). Ph. P. Werlein. Between 1855 and 1859. c1849. 91-757-RL.8. La Hache, Theodor von. "Improvisation on the Bonnie blue flag: op. 537" / composed by Theod. von La Hache. New Orleans. A. E. Blackmar & Bro. 1862. 36 cm. Gift of Mr. Alvyk Boyd Cruise. 86-1259-RL. La Hache, Theodore von. “True to the call: polka march, op. 599” / composed for the piano by Theod. von La Hache. New Orleans: Published by Blackmar & Co., c1864. 36 cm. 87-846-RL. La Hache, Theodor von. “Ever of Thee, op. 499” / By Theod[or] von La Hache. New Orleans: P. P. Werlein & Halsey. 1861. 86-895-RL. La Hache, Theodor von. “Grand March of the National Guards of New Orleans” / By Theod[or] von La Hache. New Orleans: Ph. P. Werlein, 1855. LC: M28 .L3/G7 1855. 86-1176-RL. Arditi, Luigi. "Il bacio; waltz" / T. von La Hache. New Orleans: A. E. Blackmar; C. O. Clayton, engr., lith. & printer. New York: A.E. Blackmar, 1866. 36 cm. 86-374-RL.30. La Hache, Theo. von. "Missa Pro Pace; Book of Popular Masses and Vespers" / By Theo. Von La Hache. : Hamilton S. Gordon in New York, 1867. 86-1424-RL. La Hache, Theod[or] von. “My Southern Sunny Home” / By Theod[or] von La Hache. New Orleans: A. E. Blackmar, 1865. Gift of Alvyk Boyd Cruise. 86-1457-RL. Werlein & Biggar. "Last Vocal and Instrumental Concert": Broadside. 1800s. 86-2120-RL. "Southern Departmental March." New Orleans: L. Grunewald Co., 1917. 91-600-RL. "Gold Medal Waltz." New Orleans: L. Grunewald, 1885.: 1885. 91-601-RL. Grunewald, W. N. “Saengerfest Waltz”/ By W. N. Grunewald.—New Orleans: The Louis Grunewald Co., Ltd., 1890. 74-94-L.
“The Great Waltz…Municipal Auditorium, November 26–27–28, 1936. B. M. Grunewald, Local Manager.” New Orleans. 1936. 96-468-RL. "A Grunewald Musical. Bruna Castagna, Contralto. Raoul Jobin, Tenor. McAllister Auditorium Saturday, November 8th, 1941." New Orleans. 1941. 96-469-RL. "Respectfully dedicated to Mr. W. N. Grunewald. Carreno March Two Step" / by Miss R. Escobal—New Orleans: L. Grunewald Co., Ltd., 1897. 2000-239-RL.1. Dacus, H. Edward, Jr. German Opera and Operetta at the New Orleans National Theatre, 1866–1878. Doctoral Dissertation. LSU School of Music. 1999.